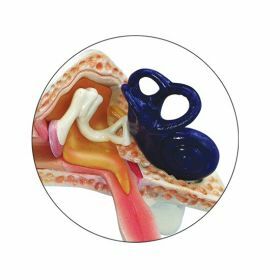 One and one-half times the size of a Child's Ear illustrating semi-circular canals and cochlea of the inner ear; auditory ossicles, otitis media (inflammation and [simulated] fluid in the middle ear); tympanic membrane and temporal and tympani muscles;. 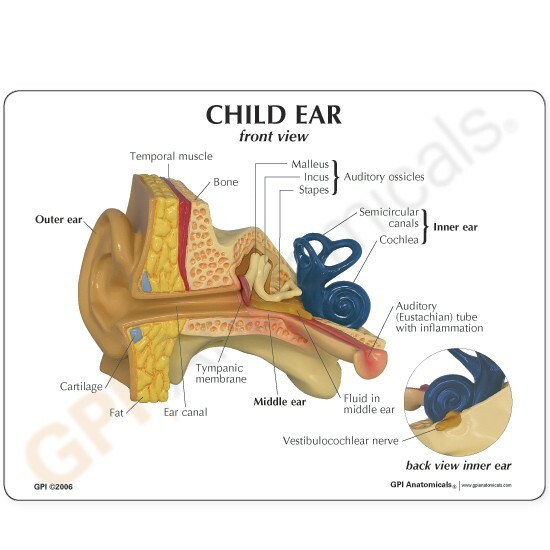 The model also represents a horizontal eustachian tube typical of a child. 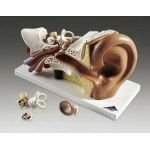 Model size: 4 3/4" x 4" x 3 1/2" Card size: 6-1/4" x 5-1/4"
Suitable for General Pediatrics, otolaryngology, auditory or hearing science, general anatomical study, training for surgical dissection, sports medicine, or for patient education/demonstration of procedures. Quantity discounts available.Brand new. 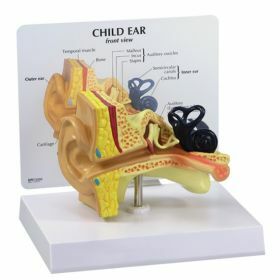 In original factory packaging. Made of a durable, plastic material accurately designed and colored to represent the major structures and, in certain instances, lesions or other abnormalities as described above. 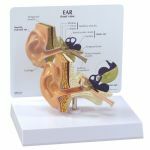 Includes sturdy and attractive display stand and detailed instructional card. 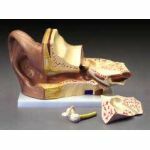 Also available Adult Ear, LFA #2250 and CLEAR Adult Ear, LFA # 2251.